Mexico has been hit by a massive 8.1 magnitude earthquake. The quake has left around 60 people dead and has managed to topple houses. This particular earthquake hit Mexico just off the southern Pacific coast. Unfortunately, it has been said that around one million people have been left without electricity. This has caused several issues with hospitals. If power is cut in a hospital and it doesn't go back on shortly, people can end up dying because of the lack of electricity. However, it must be dearly noted that it is being said that power had been restored to 800,000 people. 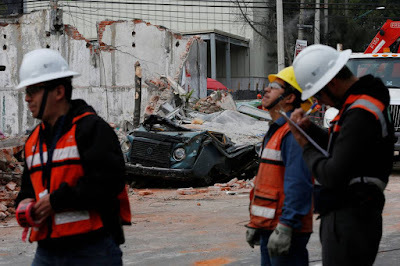 Most deaths were in neighborhoods around the epicenter of the earthquake. In Oaxaca, the death toll was around 45 people, In Chiapas, it was 12, and three people died in Tobasco. The capital of Mexico called Mexico City is said to have had people run out of their homes in their pajamas during the quake. Earthquakes happen commonly around the world but usually, they're small magnitudes. Whenever a large magnitude earthquake hits anywhere it always leaves damage in more than one place. Even with buildings that can sustain and manage to hold their weight against a powerful earthquake, most buildings can't hold against an 8.1 magnitude earthquake like the one in Mexico. It has been reported that the Mexico City airport has even had windows break from the quake.